Massage techniques like foam rolling for myofascial release and lymphatic drainage can improve the appearance of cellulite. Elite athletes and supermodels are among those making targeted massage techniques a part of their routine. Should we all be following suit? Massaging your way to a better body might sound like a pipe dream, particularly if you’re envisaging gentle treatments by candlelight. But targeted techniques like myofascial release (honing in on contracted muscles and connective tissue, stretching and restoring motion), deep tissue massage and lymphatic drainage have become central to the routines of elite athletes and supermodels alike – Brazilian lymphatic masseuse Flávia Lanini was flown in to prep the Victoria’s Secret Angels before the 2018 show – and they deliver serious results. Add to this the fact that massage has long been a core pillar of wellbeing in Ayurveda and Traditional Chinese Medicine (TCM), and the premise becomes more compelling. So, how does it work? What are the best techniques? And crucially, what results can you expect to see? “Fascia is like cling film,” explains soft tissue therapist and founder of London’s Loft Pilates, Sarah Jacobs. “Muscle fibres are like straws, if you placed them on a table they would roll away and not have any structure. However, wrap those same straws tightly in cling film and they will hold shape and stay in good alignment – so fascia is instrumental in creating the shape of our bodies." “While healthy fascia is thin, smooth and hydrated, unhealthy fascia is thick and holds toxins and stress,” explains LA-based Lauren Roxburgh, author of Taller, Slimmer, Younger – a 21-day programme that involves Pilates-style moves on a foam roller, to realign the body while strengthening and lengthening the muscles. Why it works: “By releasing fascia, muscles slide into place, so you can use breath work to reconnect the tissues and realign the body,” says Jacobs. What to use: “Opt for a long 90cm medium density roller for larger muscles, to help with realignment and rebuild strength, and use smaller myofascial balls for targeted areas like the obliques, hip flexors and feet,” says Roxburgh. The how-to: “There are two techniques – either a constant pressure, where you relax into the roller or ball until you feel a release. Or a rhythmic rocking which is great on stubborn areas,” says Jacobs. Beyond foam rolling, deep tissue massages have become the whispered secret of those looking to ward off cellulite, from Europe to Brazil. What to use: Mimic in-clinic treatments using firm, circular pinching movements. “Remodelage oxygenates tissues by improving capillary flow, while a “pinchy” motion triggers collagen production and massage softens hard areas,” explains de Richeville. The top tip: “While it doesn’t need to be painful, anti-cellulite massage is definitely not a pampering treat,” warns Shapland. “Technique is key – be firm and dynamic!” says de Richeville. 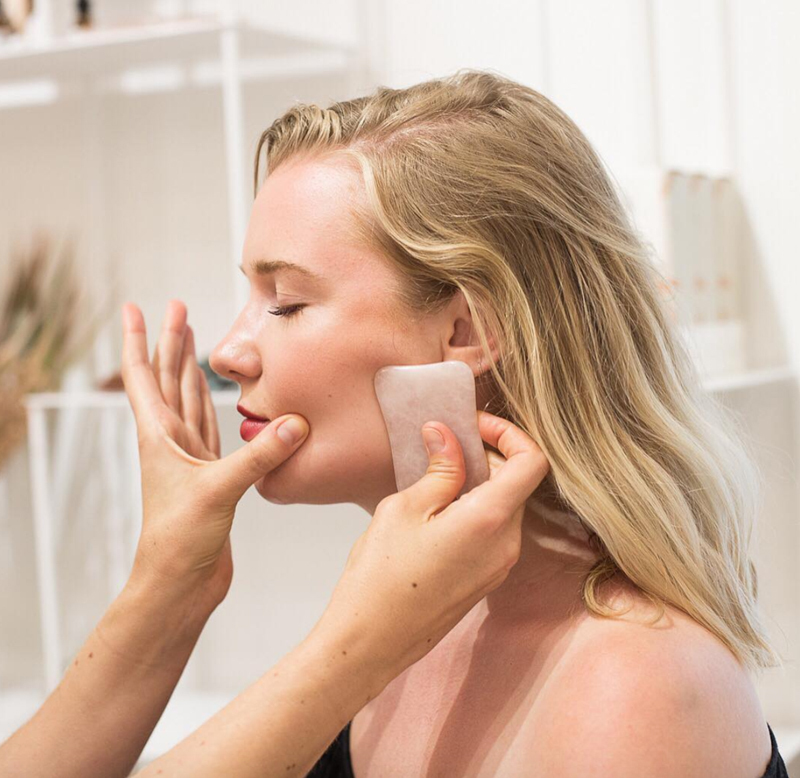 Ancient Chinese practices like gua sha (scraping the skin - intensely on the body, and more gently over the face, often using a jade tool) are becoming more mainstream thanks to their collagen and immunity-boosting results. What to use: A jade, gua sha tool specifically designed for the face or body (you can get one for the delicate eye area too). Try Hayo’u’s beauty or body restorer. The how-to: “Simply press-stroke the skin and if there’s stagnation to clear, a red mark will appear. This may sound off-putting but the redness is a temporary sign it’s working – if there’s nothing to clear, the skin won’t redden,” says Brindle. The top tip: “Best done at night to release tight muscles and help you relax, just make sure you bathe before, not after, to clean and prep the skin,” advises Brindle. It’s 2019—Why Are We Still Debating the Appropriateness of Leggings? Women's Magazine: Can You Massage Your Way To A Healthier Body?